Description: Fruiting body a mass of white, long, multiple branched stems from a common core, covered with large numbers of very small spines distributed evenly along the branches. Whole fungus 8 to 35 cm. Stems thin, branched, covered on both sides with spines 0.5 1 cm long. Flesh soft, brittle; white discoloring brownish to yellowish with age. Odor and taste pleasant. Habitat: Grows on downed hardwood branches or stumps, occasionally on wounds of living hardwood; late summer and fall. Primary Keys: White branched icicles with even spine distribution growing on hardwood. Edibility: Good. The flavor is reminiscent of crab or lobster. Older yellowed specimens are definitely bitter and should be avoided. It requires thorough washing to remove bugs and debris. The bugs don’t seem to eat it, just use it for habitat. Notes: Notes: This easily identified species was formerly H. ramosum, and what was H. coralloides is now H. americanum, which is only found east of the Great Plains. Its local and larger cousin is H. abietis, which can be more cream/yellow, with looser longer branches, longer spines near the branch tips, and grows strictly on conifers. The last cousin – H. erinaceus (PomPom/Lions Mane/Monkey’s Head) – can be cultivated, and has spines only from a central mass. 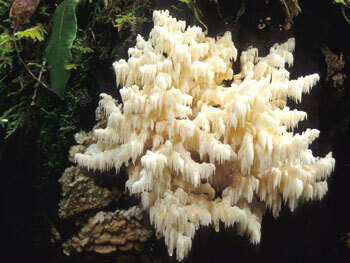 All Hericium species fruit annually for several years in the same spot. The species look and taste fairly similar and are interchangeable culinarily. They have traditionally been used for their anti-tumor and immune-stimulating properties, and there are medical studies regarding this species’ ability to help against Parkinson’s, Alzheimer’s, and other cognitive diseases. The unusual ingredients are available in Asian markets, or locally at Central Market. Clean & chop the H. coralloides into 1″ pieces. Cut the Russula xeramplina in half lengthwise then slice vertically. Cut the Hypomyces lactifluorum into 1/4″ x 2″ matchsticks. Add the coconut milk to a pot and bring to a full simmer. Add the H. coralloides and simmer for 10 minutes. Meanwhile, thinly slice the lime leaves, cut the white part of the lemon grass into 2″ sections and smash with the flat of a knife, thinly slice the galangal diagonally, and slice the peppers into thin rounds (seeds optional). Add the stock, lime leaf, lemon grass, and galangal to the pot and simmer for 5 more minutes. Add the Shrimp Russula, Lobster Mushroom, chile, bamboo shoots, fish sauce and lime juice and simmer for 5 more minutes.